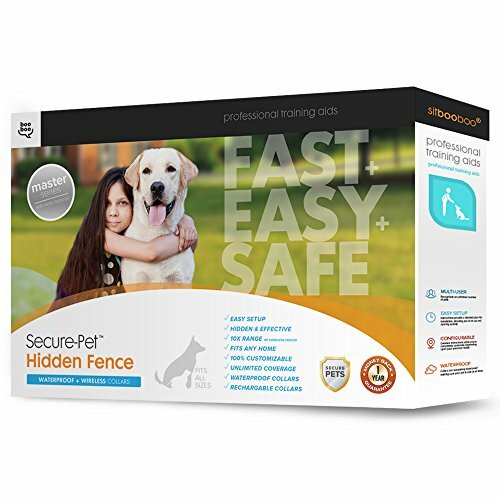 If the safety and well-being of your pet is your number one priority then you will absolutely love the Sit Boo-Boo Hidden Dog Fence. The system has been recently updated and now features a solid copper boundary wire, better transmitter performance and better battery life for the rechargeable battery. The solid copper boundary wire strengthens the signal and makes the entire system more reliable. 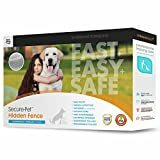 The Sit Boo-Boo Hidden Dog Fence is an unseen containment system that provides you with a quick and effective way to teach your dog how to behave. 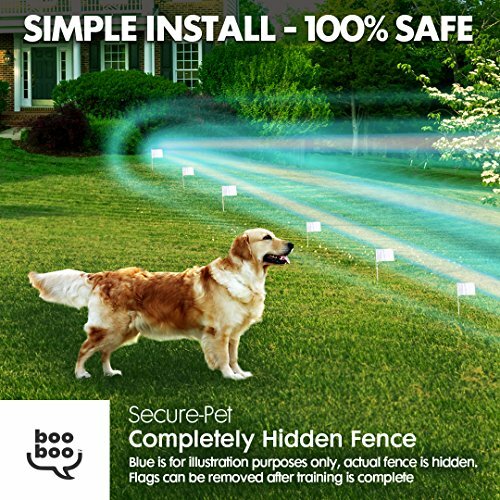 It doesn’t matter if your dog is stubborn, hard to train, or is constantly trespassing in your neighbors yard, with the Sit Boo-Boo Hidden Dog Fence you will be able to quickly set boundaries so your dog will know what areas are off limits. The system can handle an unlimited number of collars making it perfect for those who have multiple dogs. Please note you will need to purchase more collars if you need to train multiple dogs. The Sit Boo-Boo Hidden Dog Fence can be installed in ground or above ground. The transmitter device has a very attractive design and uses the latest in radio wave technology. It gives you 5 different correction settings so you can train your dog in a very precise manner. To make setting up the system quick and easy there is a detailed instruction manual included with the kit. The solid copper wire that comes with the unit is 955 ft long and can cover up to 1.2 acres. The in ground cord gives you the freedom to cover any area you want. And the best part is you don’t have to worry about radio holes that are usually a problem with most cordless alternatives. 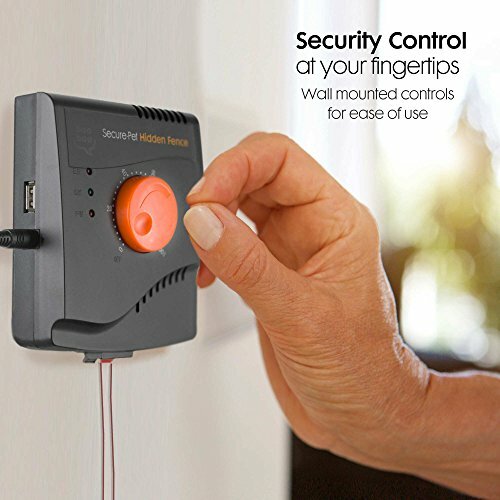 All you have to do is place the cord in the exact location you want to protect. Make sure the ground is shallow or the transmitter may not be able to make a good connection. Once the cord has been laid the transmitter will do the rest. If you need to cover more than 1.2 acres you can add more cord which will enable the transmitter to cover up to 5 acres. This makes it perfect for those who own a large property. Please note the system will work with the cord above ground as well. However, to prevent your dog from chewing on the cord it is best to dig a shallow trench around the area you wish to designate as safe. The Sit Boo-Boo Hidden Dog Fence is great for dogs of all sizes. To ensure safety the settings can be customized for each dog. The dog collar is rechargeable and waterproof making it safe to use in rain or snow. The system comes with a transmitter, boundary wire, one rechargeable collar, boundary flags for training, and a limited replacement warranty that will protect you should something go wrong. ● Has 5 different correction settings. All of which are customizable for each dog. ● Comes with solid copper boundary wire. Boundary wire covers up to 1.2 acres and can easily be expanded to 5 acres. ● Very affordable. The system costs less than $100. ● Allows for multiple zone set up. ● Some users have complained that the wire is very thin and breaks easily. ● The shock collar can be too intense for some dogs. ● The quality of the product has been brought into question by multiple users. Some have said the unit stopped working in less than a month.